Preoders for new Dreamcast Shooter The Ghost Blade opening soon! 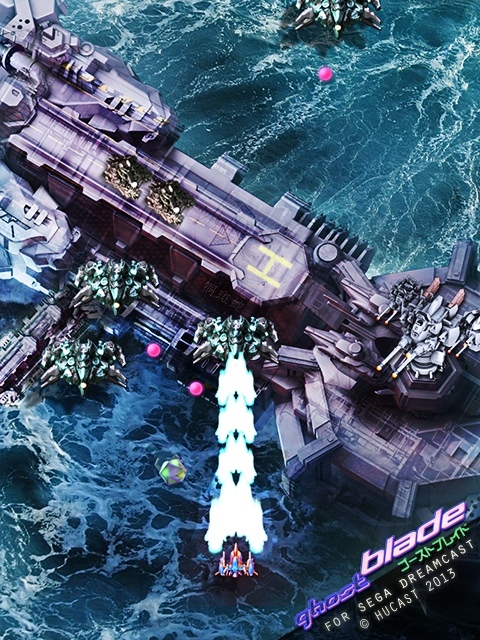 The Ghost Blade is a vertical Caravan Shooter by Hucast, the whole look and feel of the game being very different to Dux and from what we've seen so far, Redux. Kind of reminds us most of a brilliant PCB by Jaleco called Air Gallet but as hardly anyone has ever even heard of that game, we'll liken it slightly to something like... Soldier Blade, mixed with a bit of Under Defeat and a touch of Toaplan. If that sounds too good to be true, we make no apologies because we've seen an early build of the game running and we were INCREDIBLY impressed: this is going to be something special! What is it going to be? Well, another ace shoot �em up for the Sega Dreamcast with focus on arcade action joy and elaborate scoring system. And various player ships too choose from and a load of game modes, such as 5 stage game mode or challenging caravan game mode and last but not least: time attack. Although the game isn't due to be released until late in the year, preorders should be opening within the next few days, including the very limited '300pcs worldwide' Collector's Edition to which we'll be adding a beautiful double-sided T-Shirt once we've agreed the design with Ren� Hellwig.